A polymesh is a 3D model that is composed of polygons. In ZBrush, only polymeshes can be sculpted. There is only one polymesh that is available when ZBrush starts – the Polymesh3D tool (shaped like a star). 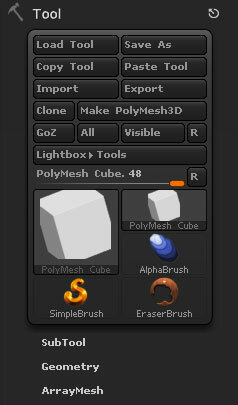 It is possible to convert the ZBrush primitives to polymeshes using the Make PolyMesh3D button, or they can be created from skinned ZSpheres. Polymeshes that have been made in other programs can be imported into ZBrush using the Import button. There are also a number of polymeshes provided with ZBrush; you can load them through Lightbox from the Project or Tool tabs. Load a ZBrush tool from a file on disk. Files must be the ZBrush ZTL format and can be either 3D models (including SubTools) or 2.5D tools such as the Simple Brush. Save a ZBrush tool to a file on disk. Files must be the ZBrush ZTL format. The Copy Tool button will copy any selected Tool to memory. Use the Paste Tool button to paste another version of the selected Tool into the Tool palette. A Tool can be copied between projects. These buttons replace the Clone All Subtools button in earlier versions. The Paste Tool button will paste any copied Tool into the Tool palette. The Import Tool button imports a 3D object from OBJ file. Modifiers for tool import can be found in the Tool > Import menu. The Export Tool button exports a 3D tool in a variety of 3D formats. Modifiers for tool export can be found in the Tool > Export menu. 3D objects can be imported into the Tool palette by pressing the Import button. Additional import options can be found in the Tool > Export menu. Makes an exact copy of the selected ZTool. If the mesh has HD Geometry this will not be copied to the duplicate. Use GoZ to transfer the selected SubTool to the target application. If there are texture, normal or displacement maps applied to the SubTool then these will also be transferred and a shader network automatically generated. Use GoZ to transfer the all SubTools to the target application. If there are texture, normal or displacement maps applied to the SubTools then these will also be transferred and a shader network automatically generated. Use GoZ to transfer the visible SubTools to the target application. If there are texture, normal or displacement maps applied to the SubTools then these will also be transferred and a shader network automatically generated. Reset the GoZ target application. Press this button to select a different application to use with GoZ. Show the Lightbox Tool tab for quick selection of a ZTool. Restore the palette configuration. When the number of items in the palette grows too large this button will restore the configuration. All but a few items will be hidden but they may be retreived by pressing the large thumbnail and selecting from the pop-up palette.